Once you have mastered the drawing tips I shared on proportion and alignment (the first two elements of the block-in process), learning how to measure angles will enhance your accuracy in drawing still further. Using the technique on this page you will be able, with some practice, to eyeball angles (or slants) and draw them accordingly. We have all used a protractor at some point in math classes, and you may have wondered what you would ever use that knowledge for. Now you know: it's for making art! 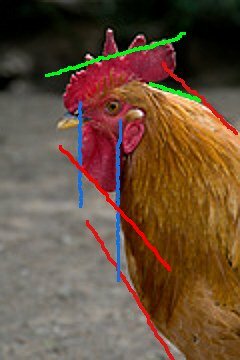 If you want more precise way to measure angles in an image, take your protractor and hold it in front of the image. Observe how everything is angled relative to a reference line and read off the angle on the protractor. It's great for beginners. Later, when you learn how to mentally work out angles, you may want to move on to that. You're already using your pencil to draw, so why not use it to measure angles while you are at it? Tilt your pencil to align with a feature in your image. Then next compare it to the horizontal border of your canvas. You can also mentally run a horizontal straight across the pencil to get a better idea. If you draw cross-hairs on your view finder, you can use it like a simple protractor. Just hold it over the feature of interest to get an idea of its angle relative to your crosshairs or simple grid lines. Alternatively, you can sketch a rough cross-hair on your canvas over the feature of concern. It's easier than comparing it to the border of your sketch pad or canvas. We all use watches and clocks every day. Analog clocks conveniently divide circles into 12 segments. 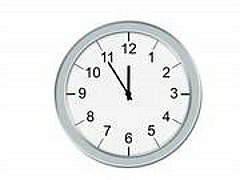 So you may find it more natural to pick out angles in terms of the time on a clock than reading the angle off of a protractor. Using the hands of a clock, you can roughly get the angles of the lines correctly down. The red and blue lines correspond to the hands on the clock below. What about the green lines? 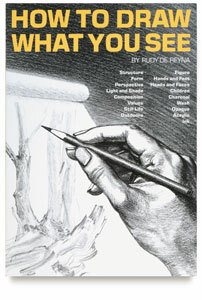 One of the powerful drawing tips I have received from the past art teachers is : start with directional straight lines?. It is the easiest way to get a rounded or curve correctly. The outlines of an organic shape are easily drawn with directional angular lines. Less corrections are needed when the subjects are drawn this way. 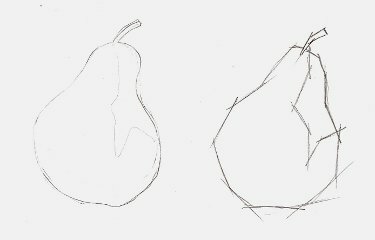 I did not have much success with the pear on the right drawn with curve lines first. With the illustration above, you first break down a continuous edge into manageable sections of straight lines (measure the angles to make sure your end points are in the right place). The tighter the curve, the more segments you need. Connect them one by one. Refine them by adding shorter straight segments. You will be surprised at how this method actually helps you draw rounded shapes better rather than trying to draw the rounded lines directly. I hope that you keep these drawing tips to your heart and I want to see your drawing skills take off! Read my review on this amazing measuring method that will bring your drawing skills to a higher level.